Shauli is sick and his Grandma tells him a story over the phone. But she is a modern grandmother and so it turns out that she`s been rushing through town, telling him the fairytale... on her cell phone! One day, the birds tell a sorceress that Prince Shau-Lin is sad. So the sorceress hurries to the palace and has lots of adventures on the way. 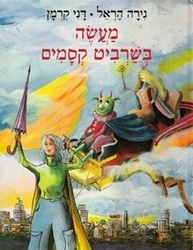 But the real world isn`t really that different: when one picture shows the sorceress going through the forest, carrying her magic wand, another shows Grandma getting through the busy city streets with her umbrella (and her cell phone). When the sorceress gets onto a horse-drawn cart and tells the driver to take her to the palace, the opposite page shows Grandma getting into a taxi, and when the sorceress discovers a treasure in a hollow tree, Grandma takes out her credit card and withdraws money from a cash machine! Finally, the sorceress reaches Shau-Lin`s splendid palace and rings the bell. At that moment, Shauli asks his Grandma to wait while he opens the apartment door. And there she is! They hug and kiss happily, and maybe the reader will learn something about artistic creation and how getting across the city to a sick grandchild can, with a touch of imagination, become a magical fairytale.